Vehicle First Aid Kits - Quality first aid kits for commercial vehicles, DOT vehicles, truckers and fleet vehicles. Quality First Aid Only Vehicle first aid kits. 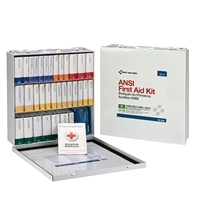 Our vehicle first aid kits are designed for fleet and commercial vehicles. Choose from a metal or plastic first aid case with to have quality brand first aid products that are easily accessible in an emergency. Our Vehicle first aid kit meets federal OSHA recommendations and offers easy refilling with the help of a full-color reordering schematic. Refills are color-coded for ease of identification. Quality Vehicle first aid kits from First Aid Only. westcoastmedicalsupply.com is your online source for all of your first aid kit needs. Shop online for discounted first aid kits for your vehicles, fleet or commercial vehicle first aid needs. We proudly distribute quality First Aid Only first aid kits and supplies.